Push Message to OS X Notification Center for WordPress Website Sounds to be a Complicated Process, But With Our Guide it is Easy Both for the Beginners to Advanced Alike. We are providing all the resources, so that any level of user can setup their WordPress Website to send Push Message to OS X Notification Center of Website Visitors. Safari Push Notifications : Apple-exclusive technology and triggered remotely using Apple Push Notification service (APNs). For local notifications and the client-side implementation of push notifications, familiarity with application development for iOS is assumed. For the provider side of the implementation, knowledge of TLS/SSL and streaming sockets is helpful. The above Plugin uses Apple-exclusive technology which is triggered remotely using Apple Push Notification service (APNs). Obviously a Server and Application on the Server will be required, which is also developed by the Plugin developer and shared in Github. This is one of the best Plugin for this Purpose. In both cases, the control, security and privacy is assured as everything is self hosted. These are paid, easy to setup but we can not provide any warranty about these services from the privacy and security part. This Article Has Been Shared 2428 Times! 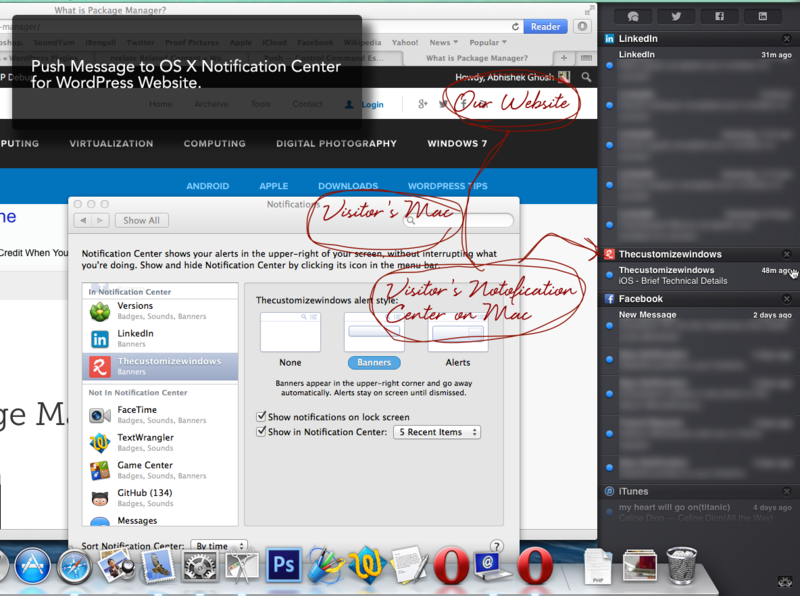 Cite this article as: Abhishek Ghosh, "Push Message to OS X Notification Center for WordPress Website," in The Customize Windows, March 3, 2014, April 20, 2019, https://thecustomizewindows.com/2014/03/push-message-to-os-x-notification-center-for-wordpress-website/.